The largest and most exquisite fleet of luxury wedding bus rental in Toronto! Get the most elegant wedding limo bus for your marriage ceremony. We have the most beautiful selection of wedding limos and bus rentals for weddings. Our wedding party buses can carry your entire party of bridesmaids and groomsmen because they have the capacity that ranges between twenty to fifty passengers! Some of the largest wedding busses also have a dance floor and a bathroom for the fun and convenience of the guests. Our limousines, limo buses, and party buses will make your marriage a perfect night to remember. One of the problems that many brides and grooms have is how to transport everyone in the most convenient and luxurious way. Sometimes, the ceremony may have many bridesmaids or groomsmen which could make it difficult to travel together. That is not an issue when you use one of our wedding bus rentals because we have limousine buses that are so big, they can carry your entire entourage in a single vehicle. Whether you have ten, twenty or even fifty of your friends and family who will be traveling with you in the limo to your matrimony, we have the perfect wedding limo bus fleet to fit the occasion. Our limousine buses the perfect mix of class and luxury at the same time. They are designed with you in mind. In fact, our Toronto wedding limo service is aimed at making your night one that you will cherish forever. One of the things that set us apart from other limo companies is that we can provide you with any vehicle that you need. If you are looking for a stretch limo that can fit ten passengers, then we have it in many colors. If you want an SUV limousine or even a Hummer, then all you have to do is visit our yard, and you will see the fantastic selection that we have. You can then choose your perfect wedding limousine service, be it a stretch, an SUV or a Hummer. Some of our buses have a dance floor as well as a surround sound system and LCD televisions. It is simple; our wedding bus hire is one of the most outstanding wedding transport services in all of Ontario. Furthermore, our wedding limo rental prices are very reasonable. We know that getting married can incur a lot of costs, so we deliver our bus wedding service to you at rates that are excellent. We also work hard to make sure that you get exactly the type of wedding party transportation that you need. When you call us, one of our consultants will ask you a few questions to determine the wedding party bus rental that is most suitable for your needs. We'll never try to sell you a vehicle that is bigger than the one which you require for your event. We'll describe all the features and selection so that you have all the right information to select the wedding bus transportation that is great for you. Getting a bus rental for wedding should not be complicated. When you deal with us, we'll make the process as simple and as pleasant as it can be. If you're looking for limo services for weddings, then we'll rent you the right limousine. We have a limousine for rent to make your marriage the most memorable night of your life. If you want a wedding shuttle bus, then we also have a great selection for you. 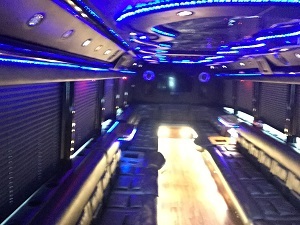 Getting the most exciting party bus for wedding is simple when you call us because we have a great deal of experience in providing transportation for wedding party guests. Our staff, drivers, and chauffeurs know that this is a paramount day for you. That is why we dedicate all our resources to make sure that it goes perfectly. Our chauffeurs are always there on time and usually ahead of time. We always ensure that we are ready for you to transport the groom and bride according to your wishes. We also have staff that can advise you on a suitable selection for a wedding limousine rental that is most appropriate for your needs. Everyone in our organization stands behind our work and is dedicated to providing our customers with the most beautiful wedding transportation in Toronto and the GTA. Call us today to learn about our other services and to get a free instant quote.